California. City of San Francisco. 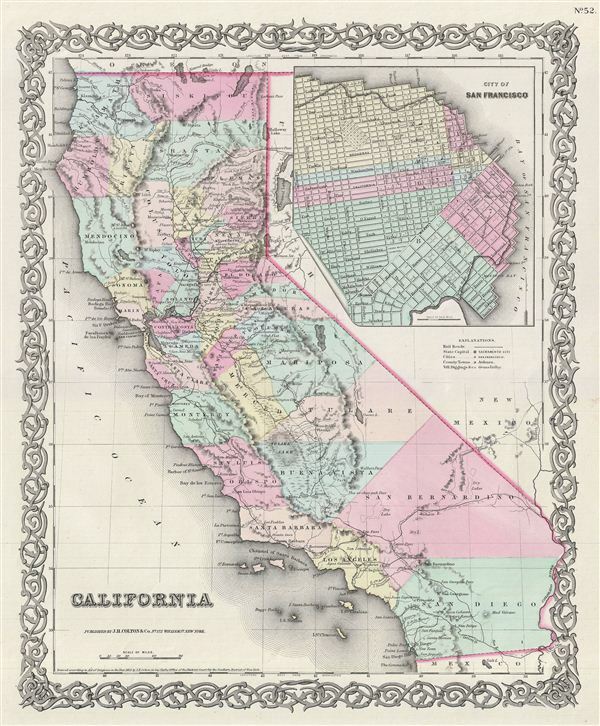 A beautiful 1855 first edition first state example of Colton's map of California. This is among the rarest and most desirable of all Colton atlas maps. Like most of Colton's state maps, this map was derived from an earlier wall map of North America produced by Colton and D. Griffing Johnson. The map covers the entire state of California with a large inset city plan of San Francisco in the upper right quadrant. The inset map of San Francisco details major streets, buildings and piers as well as various proposed landfills all along the coastline. Colton identifies a number of important emigrant and exploratory routes including Fremont's Route and three proposed routes for the Atlantic - Pacific Railroad. As this map was being drawn, various governmental and independent organizations were actively surveying potential routes for a transcontinental railroad. Here both the Beswith and the Parke routes are identified. The Beswith route enters California near Pyramid Lake before turning south to terminate in San Francisco. In the map's lower quadrants two forks of the Parke route are identified. The first or northern fork enters California from New Mexico and passes along the Mohave River to Los Angeles before turning north towards San Francisco. The second or southern fork, after briefly dipping into Mexico, terminates San Diego. Colton further offers a detailed treatment of the California gold region near Sacramento, but makes no specific mention of gold deposits. This map also identifies various forts, rivers, mountain passes, fords, and an assortment of additional topographical details. Map is hand colored in pink, green, yellow and blue pastels to define state and territorial boundaries. Surrounded by Colton's typical spiral motif border. Dated and copyrighted to J. H. Colton, 1855. Published from Colton's 172 William Street Office in New York City. Issued as page no. 52 in volume 1 of Colton's 1856 Atlas of the World. Rumsey 0149.057 (1856 edition). Phillips (Atlases) 816.